Fertilize flowers with a fertilizer that has a high middle number (phosphorous) just before it rains. Prune climbing Roses that have finished blooming. You can use an electric hedge clipper. Often, the pruning gives you another bloom. Pull spent Poppies and Larkspur out. Save seeds for next December or January. Discard spent perennials and scatter seeds. Continue deadheading and pinching back annuals. Pinch Chrysanthemums to keep them from getting leggy. Stop pinching them when buds begin to form. Pull a few weeds every day. Young weeds are easier to pull. Raise mower height to encourage a thicker, better rooted grass. Plants in bloom are Hydrangeas, Phlox, Daylilies, Daisies. Average temperature is 67°F to 86°F. Bird Tip: Provide nesting materials for birds. Building materials include twigs, leaves, and plant fibers. Water trees. Water all the way to the drip line, or where the branches stop. Remember shrubs and flowers can be replaced but it takes a lifetime to grow a tree. Prune Gardenias and Hydrangeas after blooming if necessary. Keep deadheading and pinching back annuals. Prune back Asters, Helianthus, Heliopsis, and other fall blooming plants 1/3 to 1/2. 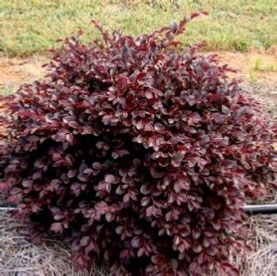 This will result in fuller plants and ones that don't flop. 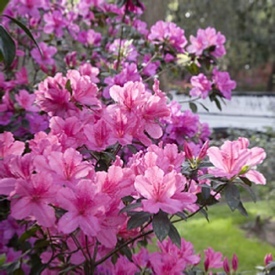 Take cuttings of Azaleas and Forsythia. The young green tips will root easily and you will have free plants. Watch plants closely for pests and treat as needed. Replenish areas of mulch that are thinning. Prune back long sprouts on Blueberry Bushes after harvesting. 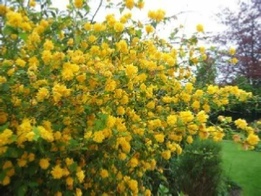 Fertilize Butterfly Bushes, Hydrangeas, and Crepe Myrtles with any 10-10-10. One tablespoon per foot of height. Plants in bloom are Roses, Clethra, Daylilies, Coneflowers, Hosta. Average temperature is 70°F to 89°F. Bird Tip: If your birdbath is in the sun move it to the shade. That will reduce evaporation and avoid heating the water. We don't want to cook our birdies!Try not to use pesticides. If you must, use them in small quantities. Try not to use pesticides. If you must, use them in small quantities. It is too hot to do much in the garden, but you should start to plan for the fall. You should also keep deadheading your flowers. The best time to work in the garden is in the early morning or early evening because it will be cooler. You can perk up containers by buying a few new annuals and pulling out old, ugly ones. Note the pretty white, tiny flowers on mailboxes and along the sides of the road. It is called Sweet Autumn Clematis. Plant some this fall. Like all Clematis they like their heads in the sun and their feet in the shade. Remove seed clusters from Crepe Myrtles. Keep fertilizing and watering them. More blooms should appear. Never leave a plant in a black pot out in the sun. The summer sun will literally cook the roots. To avoid this, either put it in a new pot or put it in the shade. Check Gardenias for white flies. Remember your hat and sunscreen while working in the garden. Brown spots on plants are rust; you can get rid of them by spraying. Liver spots are forever! Plants in bloom are Liriope, Rudbeckia, Butterfly Bush, and Sweet Autumn Clematis. Average temperature is 69°F to 88°F. Bird Tip: The water supply for birds is critical this month. The perfect birdbath should be 2-3 feet in diameter and it should have sloping sides.